Special America at Interrupt 3. Brown University: Providence, RI. August 9, 2014. Reading with Mike Young, Claire Donato, et al. Berl's Poetry Shop (126A Front Street): Brooklyn, NY. 7:00pm. July 24, 2014. 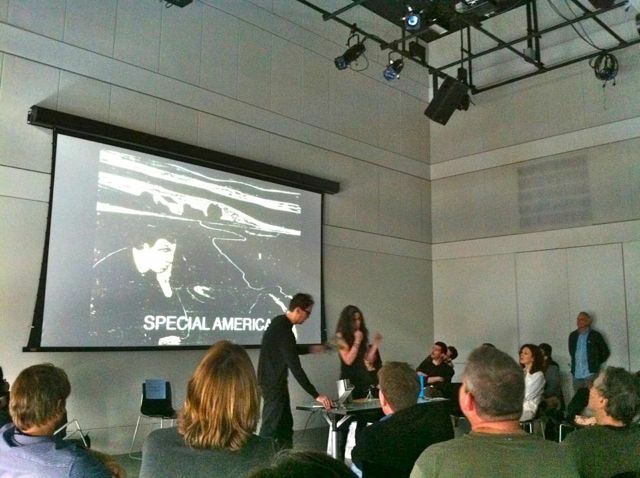 Special America (Claire Donato and I) featuring Kate Durbin and Joseph Mosconi. Pop-Hop Books and Print: Los Angeles, CA. 7:00pm. June 19-21, 2014. Three Presentations at the Electronic Literature Organization Conference. University of Wisconsin—Milwaukee: Milwaukee, WI. Various times. May 22, 2014. Reading at Emory University with Claire Donato and Megan Volpert. 1390 Oxford Road: Atlanta, GA. 8:00pm. May 4, 2014. Poesía Digital with Special America (Claire Donato and I), BENERVA!, Loss Pequeño Glazier, and Charles Bernstein. Bowery Poetry Club (308 Bowery): New York, NY. 6:30pm. April 3, 2014. Annual School of Architecture Poetry Reading with The Archiverse (Andrew Klobucar and I) and Rachel Levitsky. The Architecture Writing Program, Pratt Institute: Brooklyn, NY. February 21, 2014. Yes! Poetry Reading with Claire Donato, et al. Albany, NY. January 19, 2014. Portable Boog Reader 7: N.Y.C. and Pittsburgh. Unnameable Books (600 Vanderbilt Avenue): Brooklyn, NY. 1:00pm. January 11, 2014. Banquet: A Reading Series with SPECIAL AMERICA (Claire Donato and I), Danniel Schoonebeek, Krystal Languell, Hanif Abdurraqib. Pine Box Rock Shop (12 Grattan Street): Brooklyn, NY. 7:00pm. January 6, 2014. Monday Night Reading Series with The Archiverse (Andrew Klobucar and I) and Shiv Kotecha. Poetry Project. New York, NY. 8:00pm. November 22, 2013. The Multifarious Array with SPECIAL AMERICA (Claire Donato & I), Maria Damon, and Andrew Klobucar. Pete's Candy Store (709 Lorimer Street): Brooklyn, NY. 7:00pm. September 17, 2013. Negotiations and Burials with Ben Bush, Claire Donato, and Paul Hlava. Culturefix (9 Clinton Street): New York, NY. 7:00pm. July 27, 2013. Poetic Research Bureau with Amina Cain and Claire Donato. 951 Chung King Road: Los Angeles, CA. 7:00pm.